Home→Telecoms→Telecoms growth through diversification strategies: anaemic? Telecoms operators have launched various diversification strategies to broaden out of core telecoms services into software, media and content, and IT services. Whilst some operators have seen good success with these diversification strategies, the overall picture shows what can best be described as limited success, with just 12% of telecom operator revenues in developed markets coming from these new services. So – has growth through diversification strategies proved “anaemic” as Booz suggests? 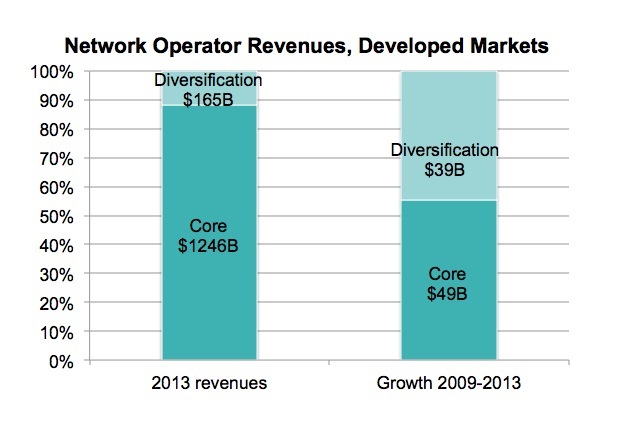 On the one hand, yes… we know that revenues are declining at many telecoms service providers, so clearly overall diversification strategies are not solving the growth challenge. But… writing-off these new services would be a big mistake. Two reasons. Firstly, by virtue of their high growth rate those 12% of ‘diversified services’ have delivered virtually the same amount of absolute new revenue growth in the last 5 years as have core telecoms services. 45% of the total to be precise, as you can see from the chart above. Given that the trends have intensified since 2009, we could now say that diversified activities are probably providing ALL the growth at many SPs. Secondly, it does take some time for new service categories to become meaningful contributors to the top line, as my previous post on telecoms revenue growth illustrates. So perhaps there is also a question of time in all this. My overall conclusion would be this. Diversification strategies – moving into adjacent markets such as IT services for example – are sensible and are already providing an all-too-rare growth driver at telcos (even if the absolute revenue figure is still small). However, something has to be done about the core business. It’s simply too large and too strategic to be left to rot. Business model innovation simply has to happen for shareholder value to be sustained. Do you agree that diversification strategies are ‘necessary but not sufficient’. What else has to happen?